Both men and animals needed protection against gas attack. 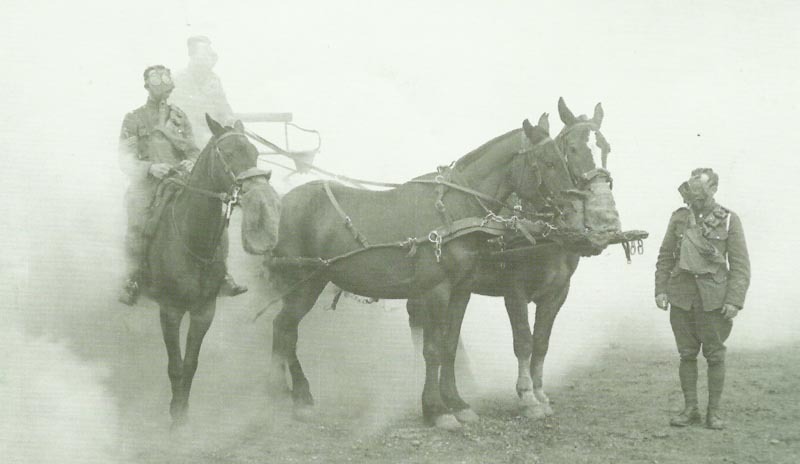 The British Army began issuing horse respirators in 1916. Battle of the Somme: British GHQ letter to General Rawlinson (Fourth Army) emphasizes it is vital to secure Ginchy, Guillemont and Falfemont Farm without delay. Foch’s co-operation secured (August 25); attack to be launched on August 29 but thunderstorms postpone it repeatedly to September 3. German attacks west of Ginchy. British advance towards Thiepval and Delville Wood. French battalion Frere (2nd battalion, 1st Regiment, 1st Division) captures all of Maurepas (until August 25) from Bavarians. Salonika: Greek IV Corps hands over forts north of Kavalla to Bulgars. Royal Navy monitor Picton shells the Bulgar troops in two villages on coast. North Sea: Battleships Valiant and Warspite (only just out of Battle of Jutland repairs) collide, repairs until September 28. Britain: 6 of 12 Zeppelins (L 13 damaged by cruiser Conquest) cross Eastern Coast, L31 drops 44 bombs on East London (first since October 14, 1915), causing 49 civilian casualties (night August 24-25); 2 of 15 defending aircraft crash on landing (thunder­storms thwart 8-Zeppelin raid on August 29).